The first and most important step is to identify and analyze bottlenecks in your existing workflow. It is important to learn how to analyze communication tools, technology, people, equipment, and all available resources to effectively identify pain points. From parts rejection to machine downtime and nonconforming components, watch out for processes where improvements can be made. A professional approach will allow you to redesign production processes to make them more efficient. It is important to reduce downtime by investing in and implementing sound maintenance strategies and system upgradation. It’s a fact that advanced manufacturing tools can dramatically improve productivity. However, without having a preventive maintenance plan in place, new technologies don’t produce the desired results. The maintenance team working on your shop floor must understand how to troubleshoot system downtime and provide reliable solutions. Regular maintenance is the only way to keep your machines up and running. If you don’t have an in-house maintenance team, hire a reputed engineering company that provides preventive maintenance and shutdown services. 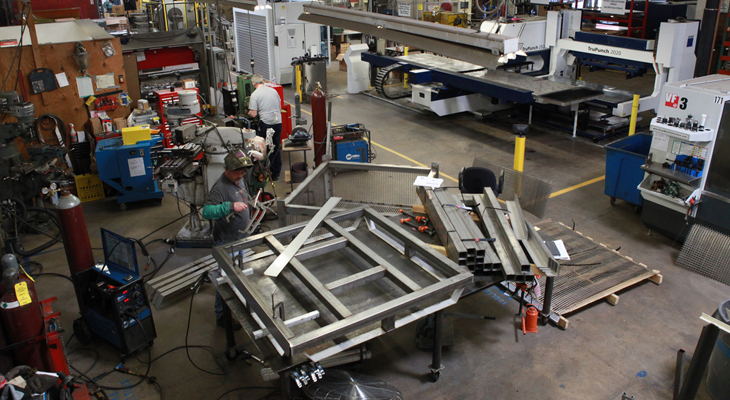 The operators and technicians working at your shop floor are as efficient as their tools or machines. Implementing smart tools such as automated welding units, metal fabrication machines, and advanced quality control systems will help you bring efficiency back to your shop floor. It is almost impossible to successfully operate in a competitive environment without investing in modern technologies. Well-maintained machines at your shop floor will not only improve labor productivity but also limit work in progress which can affect various areas in your manufacturing process. Always work with a highly experienced millwright team who knows how to improve the operational efficiency of your manufacturing machines and equipment. Quality Millwright provides a complete range of industrial millwright services including preventive maintenance, machining, fabrication, electrical, and rig servicing. If you are looking for high-precision services, give us a quick call or visit our website for more information!